In parts of Asia, endangered moon bears are kept in small cages for up to 30 years, and have their bile extracted through catheters, needles and open wounds. Starved, dehydrated and riddled with ailments, this is a living hell for the bears. The bile is used as a form of medicine. Animals Asia is devoted to ending the barbaric practice of bear bile farming and improving the welfare of animals in China and Vietnam. We aim to foster a new era of compassion and respect for animals by promoting a change in attitudes. Animals Asia houses rescued bears in our China and Vietnam Bear Rescue Centers—peaceful sanctuaries where bears who formerly experienced excruciating existences on farms may live out the rest of their lives in peace. 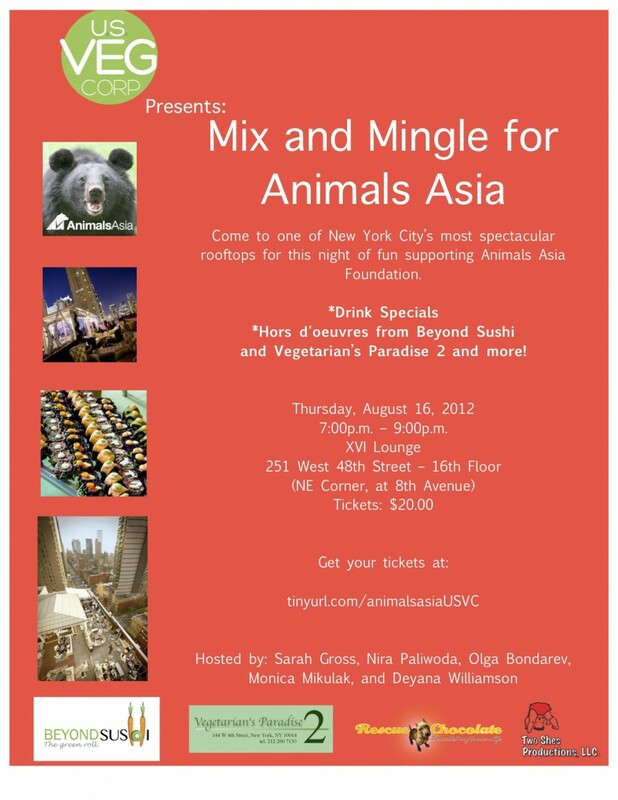 Animals Asia is pleased to partner with U.S. Veg Corp as a part of their series of New York City events to benefit animal welfare organizations. As this month’s beneficiary, Animals Asia will allow attendees to help improve the lives of animals helped by our End Bear Bile Farming, Cat and Dog Welfare, and Zoos and Safari Parks programs in Asia.